Powhatan tribes were some of the first to have contact with Europeans, and Powhatan Indians continue to live in Virginia on the first reservations created in the United States. Pocahontas was Powhatan. 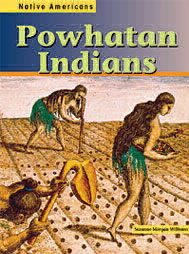 Powhatan people are firm in wanting to sort out her legend from the truth. Facts about her life are included in Powhatan Indians. Many of the illustrations are gloriously colored drawings from the 1600s.